It is so nice to think that we can enjoy various water flows like rain and massage even just at the comfort of your home becauseAquaFlow 5 Function Dual Shower Head is now available for purchase from F&W. As its name suggests, the shower features five different flows including rain, aeration, rain/aeration, massage and rain/massage. It comes with a handheld showerhead and a wall mount showerhead giving you the option to use what is comfortable for you. The showerhead features a three-way dual head shower system allowing you to enjoy both the handheld and wall mount shower at once or either of the two showers separately that will of equal pressure. 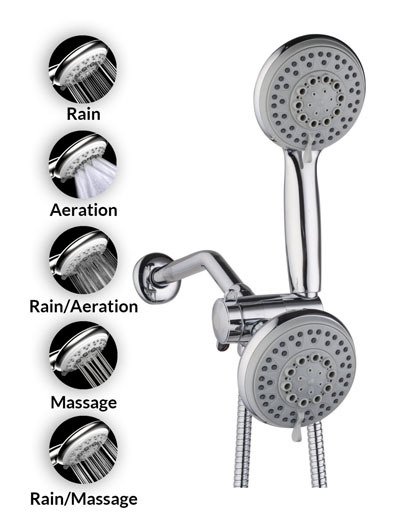 With the five functions this showerhead has, you can enjoy a luxurious spa-like shower experience.